Resident Portal: Existing Client? login here. It’s 1998 and the scene in downtown Birmingham is 180 degrees different than the scene we know today. The “Loft District” was not yet a sought after downtown community but Elisa Crowder was ahead of the curve. Already occupying space downtown at the Wheelock Building for her business, Elisa was in search of a live-work space that she could customize to suit her needs and aesthetic preferences. When she initially viewed the space she now calls home, it was the open floor plan, high ceilings and storefront windows that drew her in. Formerly an art gallery, Elisa saw it as blank canvas to design the live/work space she was imagining. Overall Elisa wanted the condo’s aesthetic to feel industrial and contemporary with a soothing color palette and almost everything in the space is custom. She added curved walls to create visual interest, aluminum baseboards to tie in the exposed ductwork, solid birch doors and earth-toned marble flooring can be found throughout. 3-Form translucent and polyresin architectural panels were incorporated in several areas and feature a design of grass, leaves, and water to bring earthy elements into the mix. It’s fair to say that beyond the architectural details, this condo offers amenities that aren’t often found downtown. 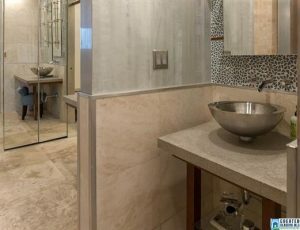 The master bathroom features a Jacuzzi tub, walk-in shower, dual sinks and heated towel racks. A sound system was also installed throughout the home so Elisa could enjoy music in every room. 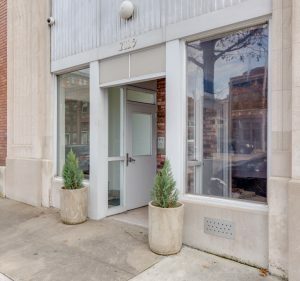 “Downtown Birmingham is developing so quickly and this property is in the center of it all, “ said Elisa when describing her favorite aspects of the home. She has loved being walking distance to numerous restaurants and bars (The Atomic is right next door), taking exercise classes at Railroad Park, popping into of art galleries and going to shows in the Theatre district. “It’s nice to have everything so close.” From new restaurants like The Essential to The Famous Peanut Depot, Barons games, breweries and clothing boutiques, everything is at right your fingertips. 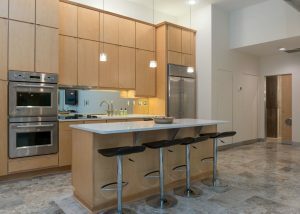 Now this fabulous 2,0000 square foot condo could be yours and features a new price! 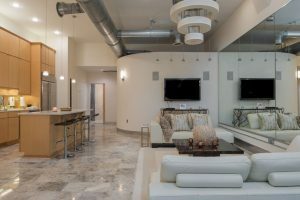 Contact us today to view this unique 2 bedroom / 2 bathroom loft-style condo in the heart of downtown. View the listing here.